What can you do to protect yourself and your company from Blyopia (see Part I and Part II)? 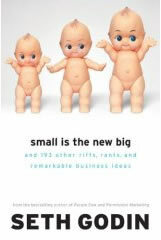 First, I recommend daily doses of folks like Andy Sernovitz (link goes to his "free stuff" page, but click his blog and then on to the entire WOMMA site), Seth Godin, and Charlene Li at Forrester Research. Buy Andy's book. Read it. Absorb the practical lessons and step-by-step advice. And while you're at it, get Seth's latest book, too. Go back and review Charlene's informative video presentation on social media (it's over a year old now, but she provides still-relevant, real-world examples like GM Vice Chair Bob Lutz's "What I Meant to Say Was..." post in GM Fastlane Blog). Of course, it won't be enough to nourish your mental muscles with healthy information. Adopt and apply the philosophy of engagement with your customers. Let go of the notion that you can "control the message." You and your product/service are what Google and your customers say you are. Put the blogging and social media tools and techniques to work in your business. Engage in the conversations going on about you and your company (at the very least become aware of what's being said, written, and passed on). Can blogs and other customer generated media produce sales? Sure. 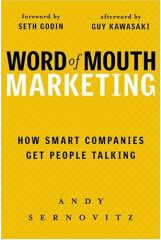 Think back to the Blair Witch Project movie, or the more recent The Purpose Driven Life book (over 25 million copies last I heard; info about the word of mouth campaign here). Recall the Mentos side of the examples in Part II. But focusing too much on the sales benefits of blogging is itself a mild form of Blyopia! Expand your view. Let's reconsider Andy's email campaign example described in Part II and add some "RIPPED FROM THE HEADLINES" flavor to it. Suppose the email campaign was designed as part of a new product launch for a really cool new wireless device that delivered streaming media so fast users could download and listen to music and engage in real-time, online gaming simultaneously. Your R&D folks did some user-testing in controlled environments the way they thought users would use the device. They designed the battery pack and wrist strap based on those tests. But suppose real-world users didn't see the device the same way as the engineers. Users quickly wrote scripts to monitor web content, subscribe to RSS feeds, and thus wanted to leave the device on most of the time. And when they were free of the testing environment, they used the device in their gaming more, shall we say, enthusiastically than the engineers had expected. Under real-world user conditions, the battery packs caught fire and the wrist straps broke. Injuries to nearby objects and to some users themselves occurred, not to mention tarnishing the company's brand value. Product recalls and damage claims followed. In this example, perversely, the more "successful" the email campaign was in generating sales of the defective product, the greater the harm to the company's overall health. How might a blogging and social media strategy have helped the company? It's not much of a stretch to imagine potential customers reacting to leaks of the coming new product -- months before the launch -- on their blogs and MySpace pages and sharing their "wish lists" of features (go spend some time on the GM Fastlane Blog, if you doubt customers will do this). Maybe some speculate on ways they could use the product as a mobile monitoring/downloading device that might have allerted engineers to the "always on" power problem. Maybe one jokingly refers to the Nintendo Wii and suggests that your company design a wrist connector "like a biker's wallet chain" -- adding both indestructability and a cool-factor. Monitoring what's being said out there is the barest minimum any business should be doing in the blogging/social media realm. Had our hypothetical company been monitoring the blogosphere, it might have understood its customers better and designed away the problems before they happened. Engaging with the customers, however, could also provide an early warning system and enable the company to react quickly and positively when a defect is found. It's easy to imagine the hypothetical company's initial response to reports of broken straps and fires coming from the PR department and consisting of defensive statements about the product's careful design and testing and the need to investigate the reported incidents. The result would likely be further customer anger, blog and YouTube postings of user-generated videos showing the defects in action, and additional harm to the company's brand. But if the company president got the reports in the comments on her own blog, the response would likely be more direct, personal, and ... well ... responsive. Chances are she will have had some serious discussions with legal, engineering, marketing, and so on. But if she's smart, those discussions will be short and the responses to her personal contacts in her market (her blog readers) will be prompt, meaningful, and provide effective solutions. Perhaps part of the lesson is that blogging and social media as a business tool is a higher level function than can be entrusted solely to the marketing or PR folks? A recent Fast Company article criticizing heavy-handed attempts at viral marketing closes with, "if there's a way [for marketers] to miss the point, they'll find it." We can't cover all the possible benefits from engaging with your customers via social media in one post. The books, blogs, and other resources I've cited and linked (as well as many of the posts right here at WME Blogs) will give you much more detailed information. Heck, new benefits along with new forms of these tools, remain to be discovered, like the measuring sticks we'd all like to have. (For some explanation of why the measuring criteria we have don't work and why it may be a while before we get new ones that do, see Jeff Jarvis' BuzzMachine post, Size doesn't matter: the distributed media economy.) So just brainstorm a bit about your own situation. And then get started. If you need a jump-start in business blogging, let us know. And once more I want to extend my apologies to Bob Bly for having some fun with his name -- and thanks for being such a good sport about it. The point should not be lost that his book, too, is well worth reading. He does acknowledge some of the benefits of blogs and offers many cautionary observations that will help you avoid misusing them. His contentions will force you to think (usually a good thing) about how blogs can -- and can't -- help your company. For some additional reviews of Bob's viewpoint and Blog Schmog check out Yvonne's Lip-Sticking Top 10 Business Books post and, for a mixture of serious criticism with a few rather unreasoned rants (which unfortunately tend to demonstrate one of Bob's legitimate complaints about a small minority of bloggers), read the post Bob Bly Is Wrong About Blogs, with comments, and related post links over at Simplenomics.